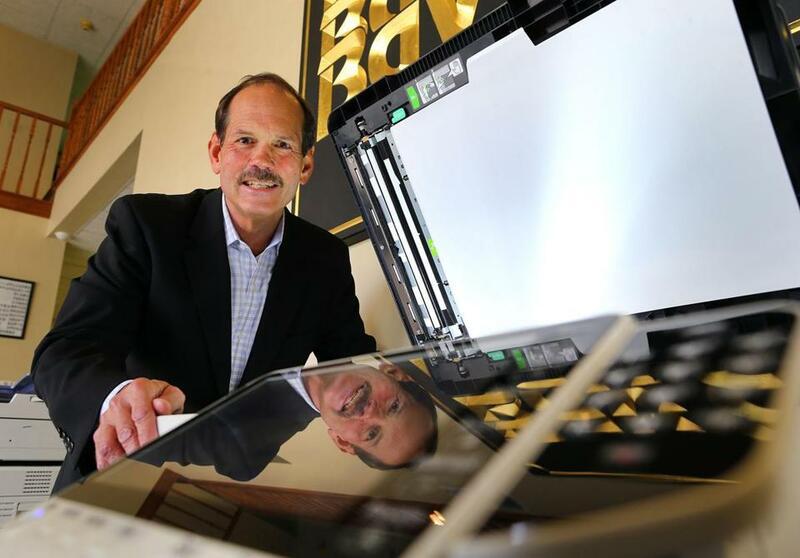 Rockland-based Bay Copy is a second-generation medium-sized family business with about 30 employees, specializing in selling and leasing copiers and printers and the technology that goes with them. Owner Ray Belanger Jr. of Norwell is also a founding member of the national Select Dealer Group, and his company has won a variety of awards, including the US Chamber of Commerce’s Blue Chip Initiative Award. We talked to him for this story. Q. How did Bay Copy start? A. My father, Ray, started it in 1972. What’s interesting is that he worked for another copy company in administration, and usually people starting their own companies come from service and sales. He started in Abington and moved to Rockland around 1985. I worked here as a kid, in summer, part time, then went to college, got my master’s degree, and worked outside the business for a few years. I came back in 1982, so I’ve been here 34 years now. My dad retired 25 years ago. Q. What’s the bulk of what you do? A. Sales and service of copiers and printers, working with small local businesses up to large hospitals and health organizations. Service is key to what we do. We have a lot of experienced people; some have been here 20, 30 years, so we get there fast and fix any problems the first time. Q. What are the challenges of your business? A. The technology, which is always changing and improving, but to me, it’s understanding what our customers’ needs are and trying to solve their business problems. There could be 10 things you offer, but one or two of them can really make a difference for one particular company. Q. How has growth been? A. It’s been good; we’re going through a growth period now. We’re fortunate to have been in it so long, and have really good people working for us. Q. How big are some of the products you sell and lease? A. It varies, and is relative to customer need. In some health organizations, we can have hundreds of small, multifunction machines and we also have large equipment 15 to 20 feet long for big copy centers; it’s the full spectrum. And since we’re independent, we’re not locked into one particular brand.